The crisp fall air wraps around you like a blanket. Changing leaves and the feeling of something new surround you—as if this season couldn’t get any better. You woke up this morning with one thing on your mind: college football. There is nothing on this planet like college football. You watch as teams fight for the bragging rights and their future in the sport. It’s time to pack up your car and head to the tailgate. You are one of countless fans who make it a point to show just how loyal you are. The hours spent celebrating before the game set the mood that the team will carry with them throughout it. But the way you tailgate could define your go green mentality for the rest of the season. When it comes to recycling on game day, it can be a challenge to make a difference. There are so many folks who don’t carry the same waste management mentality that you do. How can you counter their effect on the environment? Will your efforts even be worth it in the long run? It’s a scientific fact, and really more of an obvious point to admit that large amounts of people in small spaces are going to generate copious amounts of trash. From the moment you pull out of your driveway to the time you’re exiting the stadium, you would be impressed at how much waste you’ve left behind. When it comes to college football stadiums, this is a whole different ball game. The biggest stadiums can actually attract as much as 11,000 people. Without proper recycling protocols in place, this is a lot of trash taking over our landfills. This go green phenomenon hasn’t just sparked interest in Utah. As a matter of fact, the need for better waste management services has hit as far as the federal government. The EPA has decided to get involved in making college game days more recycling friendly. The EPA’s Game Day challenge lets our schools compete in more than one area. The free partnership program assists schools with meeting their waste management and recycling goals. How it works is, your school officially signs up for the challenge. During one home game in the month of October, you design and implement a recycling strategy. The results are calculated by measuring the amount of waste generated; the volume of glass recycling, metal recycling, and everything in between; and finally, it’s offset by how many people were actually in attendance. When this challenge began in 2009, only 8 schools were participating. However, these 8 schools reduced their waste by 44,000 pounds. In 2010, the amount of involvement jumped to 88 schools, seeing the potential to have a cleaner environment, not to mention the bragging rights that go along with it. In the year 2017, participants reduced their game day waste by 2.06 million pounds. This is broken down into 1.5 million pounds of bottles, plastic, and cardboard that were recycled. There was a total of 540,000 pounds of food waste composted. Finally, 2,400 metric tons of carbon emissions were removed from the air, thanks to an increase in available public transportation. Winners are announced in the month of November, as you’re watching your team gear up for the championship games. Why not bring another trophy into your school? Allow that school pride to increase the amount you reduce, reuse and recycle. How Can I Enjoy the Day Responsibly? Perhaps your school isn’t one that’s sparked an interest in the game day challenge. Or maybe, on the other hand, they have, but recycling is only available in the stadium, leaving your tailgating spot hanging. It’s up to you to keep that go green mentality, as you look for ways to increase your glass recycling and metal recycling. Here are a few tips to keep in mind. It all begins with the amount of waste that you’re bringing to the tailgate with you. Like any good fan, you’re planning on firing up the grill and going all out with a barbeque. Try to do your prep work at home. Instead of carrying extra plastic wrappers and disposable bags, bring reusable Tupperware containers with you. These will last the entire season, and it will allow you to do the most important recycling from home. Not to mention, this will give you the extra time to marinate your burger meat—the other team’s fans will be jealous. If you’re hanging out in an ill-equipped parking lot, it’s on you to keep up with your waste. Be sure to bring bins or bags with you. One can be dedicated to regular waste, while the other is meant for your recycling. Be sure that everyone who you’re celebrating with knows the difference. When you take this waste home with you, take it one step further by separating the glass and metal recycling, making it easier on your waste management company. In the case that your school has gone above and beyond to prepare, take the time to find the proper waste bins. Many universities now carry brown, blue and green bins for your unique recycling needs. Do your best to plan ahead so you can utilize these. As always, try your best to buy from companies that use compostable or recyclable packaging. This way, you can start improving your waste management from the moment you think about the game. Bring reusable utensils, plates and cups to further cut your waste. Across the state of Utah, we are known for being proud of our teams. Whether you’re wearing crimson red or royal blue, you want to show that you’re proud to be a fan. By planning ahead with a healthy recycling program, you can take this even further. 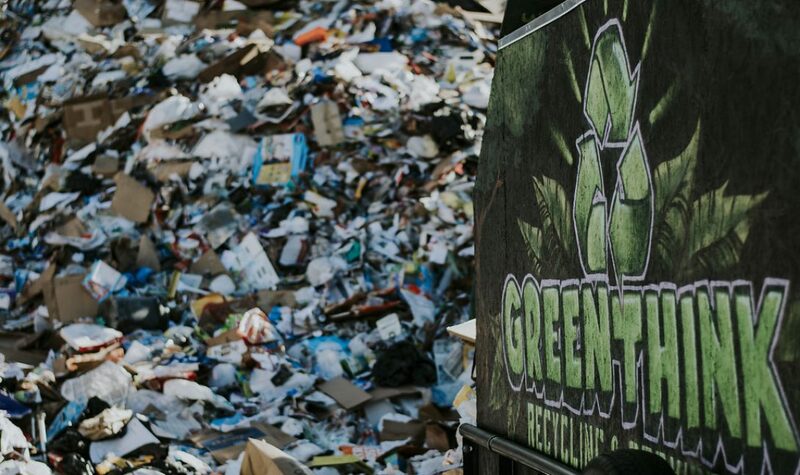 Contact GreenThink today to get an idea of what we can do to help with your game day waste management. And above all: go, fight, and win. Next Post Why Is Reducing Waste Important & How Can I Do It?